Home » Our Doctors » Vicki T. Nguyen, O.D. An Arlington native, Doctor Vicki Nguyen returns to North Texas to service the community that has shaped her. 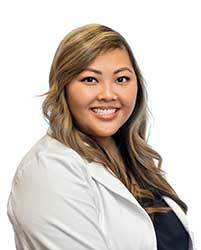 Dr. Nguyen earned her Bachelor of Science degree in Biology from the University of Houston in 2012. During her undergraduate studies, she was a member of the UH Pre-Optometry Professional Society and was accepted into the University of Houston College of Optometry. During her training in both Dallas and Houston, Dr. Nguyen had the opportunity to see patients with a wide variety of ocular pathology and special needs. At Cedar Springs Eye Clinic in Dallas, she provided medical-based eye care with emphasis on specialty contact lenses, glaucoma, diabetes, and cataracts. Her second internship was in private practice, where Dr. Nguyen provided primary eye care for residents of northeast Dallas, which included managing and treating various eye infections, dry eyes, and LASIK. During her final semester at UHCO, Dr. Nguyen was selected to rotate through the Special Needs Adult and Pediatrics clinic and the Ambulatory Service Center, where she gained more insight into managing post-op cataract patients. While there, she performed comprehensive eye examinations on children and adults with cerebral palsy, Down syndrome, autism spectrum disorder, and other special needs conditions. Dr. Nguyen enjoys working with children as well as adults and has volunteered at the Special Olympics Opening Eyes event since 2012. As a student, Dr. Nguyen earned Letters of Excellence for her performance in clinic. During her last semester, she earned honors selection on her grand rounds presentation, awarded by the executive director of the University Eye Institute. After completing her Doctorate of Optometry degree from the University of Houston College of Optometry, in 2016, Dr. Nguyen now joins Texas State Optical Mansfield. Dr. Nguyen has a passion for patient care and her goal is to provide an extraordinary and memorable experience with every patient. Like all Mansfield TSO doctors, she takes the time to thoroughly educate each patient about their eye health status. Dr. Nguyen is a licensed Therapeutic Optometrist and Optometric Glaucoma Specialist. She is an active member of the American Optometry Association, Texas Optometry Association, and Tarrant County Optometric Society. Outside of seeing patients, she enjoys spending time with her family, traveling, playing volleyball, and of course, cheering on our home teams, the Dallas Cowboys and Dallas Mavericks! Texas State Optical Midlothian is launching April 8th 2019. New TSO Location, Same Great Service!